Paris Saint-Germain star Kylian Mbappe has reportedly told his team-mate Neymar of a transfer offer on the table for him from Manchester United. The France international is undoubtedly one of the best players in the world at the moment, enjoying a remarkable rise in the last couple of years, first with Monaco, then with PSG, and then as part of France’s World Cup-winning squad in Russia this summer. According to a sensational claim by Don Balon, Mbappe has now revealed to Neymar that United are desperate to sign him next summer and make him the highest paid player in the world, moving him above Lionel Messi. This would be some show of ambition from United, who do look in need of a marquee signing to get them back to their glory years, especially with Manchester City’s spending being what it is at the moment. 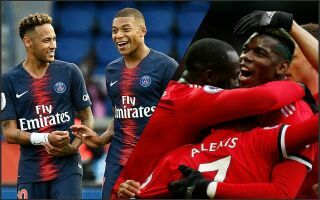 Mbappe looks certain to be one of the finest players of his generation and would surely be well worth the investment for the Red Devils if they could pull this off. Don Balon add that MUFC would likely look to sell Paul Pogba to raise the funds required for the Mbappe transfer. The 19-year-old only joined PSG last season, but may want the bigger challenge of playing in the prestigious Premier League before too long. Can you see Kylian Mbappe joining Manchester United?